* Polished SS Tips Magnaflow's Stainless St eel Catback system for the 1998-2009 Ford Ranger with the 3.0/4.0 V6, Extended Cab/Short Bed features 2.5" mandrel-bent tubing with dual split rear exit and 3" slash, polished stainless steel tips. The Ford Ranger is considered a Mini-Truck by many, but add a Magnaflow system and there's nothing small about the Ranger's performance. Both the 3.0 and 4.0 V6 Rangers see big benefits from Magnaflow. 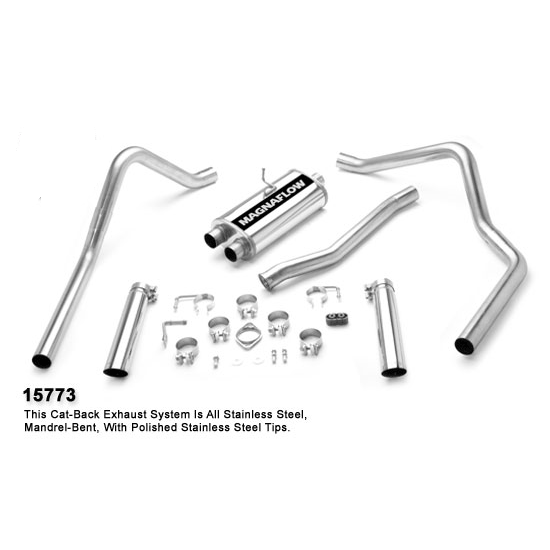 Systems feature fast-flowing, mandrel-bent tubing, an 18" long Magnaflow performance muffler and a 3.5" polished stainless steel tip. The 4.0L V6 Ranger gets it done on the dyno with performance gains of 14.5 horsepower and 9.8 ft-lbs of torque! Magnaflow Exhaust systems are the most popular exhaust systems on the market today. Magnaflow designs and builds each system to fit and sound perfectly for your vehicle, whether it be a car or truck, American made or foreign. Magnaflow exhaust systems are all built with high grade stainless steel components and feature stainless welds and clamps. Backed by a Lifetime Warranty. No one else gives you the bold clean styling of our Aftermarket Dress Ups, Suspension and Performance Parts for your American Muscle Car like UPR Products! Click Here for Instructions Fits these Vehicles: 1998 1999 2000 2001 2002 2003 2004 2005 2006 2007 2008 2009 Ford Ranger V6 3.0L 4.0L. *Does not fit Edge.